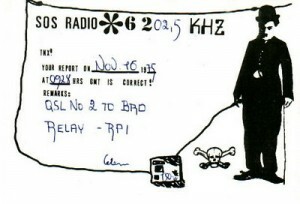 The first show from SoS, was relayed by Radio Poseidon International the 16’th of November 1975. Other transmitters was used too, i.e. Radio Snoopy International. After the first four programs, 94 reports was received and 78 of them from the first program. In 1977 someone put his transmitter in the hands of SoS’s, and after that they could have more regular broadcasts with this 15-watts strong Tx. This was the 8’th of may. In the early 80’s a new semi-professional transmitter was purchased, and the operators were making up plans for a new era of free radio with regular transmissions. Tests were taking place during march, April and July and in the end of September 1980 the first regular transmission took place. In march, the transmitter quit the job. All thanks to a bad antenna. In may, the technicians had put the transmitter back again to work. This transmitter gave as much as 35 watts on 6200 kHz. The schedule was every 3rd Sunday from 0900 to 1100 hours UTC. The manager called himself Glenn Roberts, and the DJ’s was Martin Swede, Jeff Anderson and John Howenz. 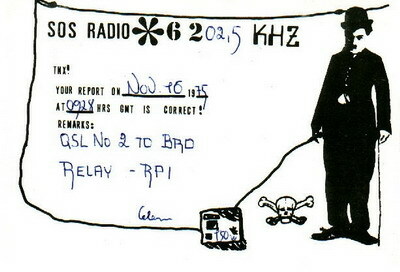 To get an answer from this station, the reports had to serve some standards from SoS. The last time this station was heard was in 1985.